See seven of the world's natural wonders as you've never seen them before on Blu-ray next month. 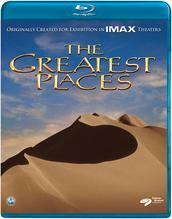 In an announcement to retailers, Inception Media is preparing 'IMAX: The Greatest Places' for Blu-ray on May 17. This dazzling IMAX adventure features Greenland’s massive icebergs, Madagascar’s unique inhabitants, the Namib Desert’s sprawling dunes, the lustrous Okavango Delta, Tibet’s ancient plateaus, the roaring Iguazu Falls and the mighty Amazon river. A tour of our planet’s most natural wonders, featuring remarkable wildlife, mighty natural feats that will make you gasp, natural land formations and brilliant topography … all captured in beautiful detail for a rich, vibrant experience you will never forget! The Blu-ray will feature 1080p video, a DTS-HD Master Audio soundtrack, and supplements will include an IMAX trailer reel. Suggested list price is only $19.98. You can find the latest specs for 'IMAX: The Greatest Places' linked from our Blu-ray Release Schedule, where it's indexed under May 17.